6 year old Cassius says that King Burue Changes the Rules is one of his favorites. He was so excited that he asked his parents, "Please take my picture and send it the girl to say thanks for being so smart... and how did she know I love animals." I wanted to share with you that I loved this book. When I read it, I was so impressed with how your daughter took such a "grown up" idea and made it simple for kids to understand and relate to. Her message and the way she presented it can truly reach the minds of children and the impact could be so powerful to them. What a blessing she must be to you. I hope that the book reaches many children! Our family read King Burue Changes the Rules together. Not only did we enjoy the simple yet beautiful illustrations, we also appreciated the message. It takes talent to communicate a message of such depth with the language and perspective that people of all ages can understand. "All of our family have read your book-it is just the most wonderful, amazing story of kindness and caring about others! We thank you for your great talent- may you keep sharing it always! "I am so impressed with Natalija's book. 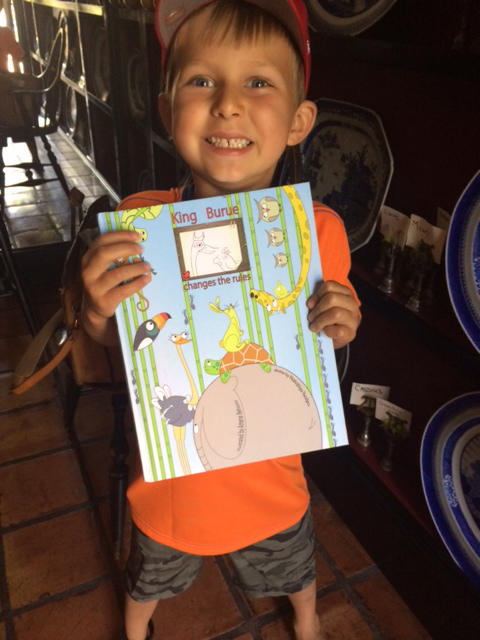 King Burue is an important read for all ages. Acceptance is the key to a peaceful global existence, and who better to remind us of this than an 8 year old. Creative, engaging and meaningful; this book matters. Read it as a family - you won't be disappointed." I loved the reading of the story by the young author. It is a very inspiring book that can teach everyone both young and old a few things about showing acceptance and respect for others. Although some rules and norms are old and have withstood the tests of time, some are too old and should be rid of. Natalija's book can clearly shows that the world has long been overdue of such a young and fresh reminder of the importance of acceptance for everyone. Tell us how King Burue affected you? What was your interpretation? What was your favorite lesson? What will you do different? Come meet Natalija at her book signing during the official launch of King Burue Changes The Rules at the Los Angeles Times Festival of Books, where over 140,000 people will gather on the USC Campus, April 12-13, 2014.